John Shaw, the Harry C. Dudley Professor of Structural and Economic Geology and a professor of environmental science and engineering, expects natural gas to continue to displace coal in electricity generation. It is projected to become the nation’s largest electricity-generating fuel by 2040. The natural gas boom that transformed the energy picture in the United States in the last decade is still in its infancy, says John Shaw, chair of Harvard’s Earth and Planetary Sciences Department. Shaw, the Harry C. Dudley Professor of Structural and Economic Geology and a professor of environmental science and engineering, expects natural gas to continue to displace coal in electricity generation. It is projected to become the nation’s largest electricity-generating fuel by 2040. In addition, he said, opportunities for expanding the market lie in export to energy-hungry nations such as Japan, which has curtailed nuclear power in the wake of the Fukushima disaster, and, closer to home, in the U.S. transport sector, where trucking fleets provide another opportunity, perhaps first through the installation of natural gas filling stations along highways. Further, the low cost of natural gas has set a new standard for the energy sector. 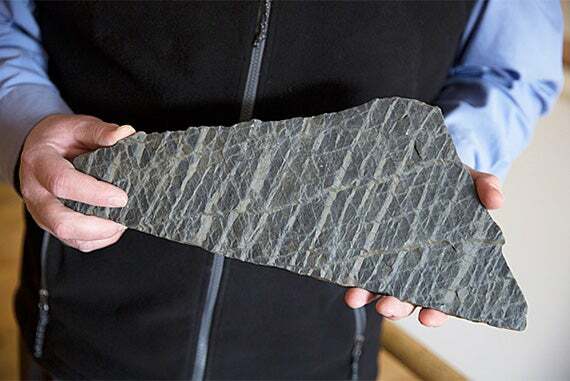 Drillers have long known that gas is released when shale beds are penetrated, but the pores in the rocks are so small that they hold onto their gas — and oil as well — tightly, so that very little flows into the borehole. For decades that left petroleum firms to focus on resources found in other formations, whose more porous rock allowed gas to flow in commercially viable quantities. It was the marriage of two existing technologies — hydraulic fracturing, or “fracking,” and horizontal drilling — that created the shale gas boom, Shaw said. Companies began drilling down thousands of feet directly into the shale formations and then drilling horizontally along them. Today, workers line the boreholes with a concrete casing, perforated at particular spots where the fracturing will occur. Then they pour in the fracturing fluid, made up largely of water and sand but with a mix of other chemicals as well. That liquid is pressurized and forced through the holes in the casing into the surrounding rock, with enough force to fracture the rock. The sand particles prop open the fractures, allowing the gas to flow more freely into the borehole. Shaw said that some of the problems that have generated opposition to the process — contamination of water supplies, induced earthquakes, and methane release into the atmosphere — come not from the fracking, but from associated activities that could be improved upon. Because it occurs thousands of feet below the water table, fracking itself probably does not release fluids into the water, Shaw said. The likelier explanation, he said, is that failure of the concrete casing higher in the borehole allows fluids to escape into water supplies. The issue is familiar and strategies exist to detect weak spots, he said, citing the role of casing failure in the 2010 Deepwater Horizon disaster. A device called a sonic scanner, which can help determine the thickness of a casing, was sent home from the drilling platform without being used before the blast, which left 11 dead. Fracking is probably not a direct cause of associated earthquakes, Shaw said, noting that the pressure to fracture the rock is applied for only minutes and is followed by the gas flowing from the rock into the borehole, which actually lowers the pressure in the surrounding rock. Instead, Shaw said, it is the disposal, by injection into the earth, of the ample waste liquid the process generates that is largely responsible for generating quakes. Some firms are now looking at recycling wastewater as an alternative. The release of methane is a particular concern because it is a much more potent greenhouse gas than carbon dioxide. These releases and possible methods for controlling them are still being studied, Shaw said. Methane release is a systemic problem, contributed to in part by aging distribution infrastructure. Shaw cited a study of Boston’s natural gas infrastructure that found even higher losses — between 2 percent and 3 percent — than the rate generated by fracking. Still another concern stems from the economic success of natural gas. While some see low gas prices as beneficial to the environment because they undercut coal, which releases about twice the carbon dioxide as natural gas, the same prices also undercut cleaner renewable sources. It is up to citizens and their representatives, Shaw said, to determine an energy mix. If renewables are desirable, action has to be taken to make them competitive, through subsidies, tax credits, or even a broader carbon tax, which would increase the price of fossil fuels. The Food+ Research Symposium, in conjunction with the Harvard Better Food Campaign, served as a platform for discussing the future of food as it relates to current infrastructure, technological innovations in science and agriculture, and global health and nutrition.